Last week, my children took their annual standardized tests at our umbrella school in Knoxville. In Tennessee, one can sign up under the local school district, or with an umbrella school. Umbrella schools come in different shapes, forms and sizes. Some are remote places that will not require much of you in exchange for the piece of paper which shows that you are not truant. 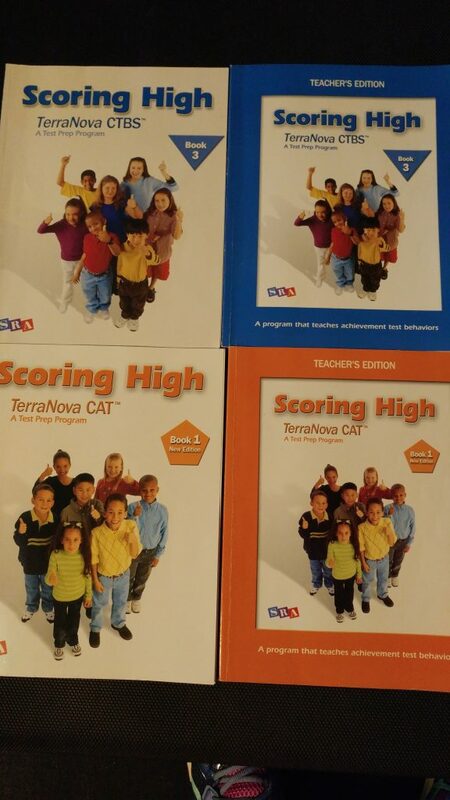 Test Prep books we used – our test is called Terra Nova 3. Others are local brick-and-mortar schools with a homeschool umbrella program. As such, they will give your child a diploma when high school graduation comes around. The diploma will not even mention the word “homeschool,” which makes the umbrella school hold parents to a high standard. Many such local umbrella schools require annual testing. Our umbrella school, Berean Christian School in Knoxville, requires testing starting in second grade, with an optional test in first grade. I know people who are not registered officially to homeschool for fear that their children will be required to test. The conspiracy theories abound among such people. That their children will freeze and not score high or, on the contrary, do a great job, but the test providers will give them a bad score, which forces the parents to put them in public school etc. I have made up my mind that I will not be truant. We live in a free world, governed by laws. As long as I follow the law of the land, I want to believe that nobody will come knocking on my door to ask for my children. I have documentation on hand which shows we are registered legally for homeschooling in the State of Tennessee. And if testing shows my children do not score well, then I am the first one to put them in a different academic environment or the change what we are doing. But, as it turns out, my children score well. We will only know the results of these tests in April, I think. Judging from the previous two years, we should be fine this year, too. This year, one of my children said the test was “very easy.” The other one had time to draw three pages of detailed comics during the test – they finished that much ahead of the allotted time. So I am not worried. We like to cover a lot of material before the test even though it is not an end-of-year test. This is simply a preparation for the ACT or SAT – whichever we will decide to take once college plans must be made. It is also a tool for me to know if we are doing a good job or not. If we have gaps in our knowledge, we had better know about it, right?